Instead of gears, the NuVinci uses ball bearings placed between two adjustable rings. Adjusting the angle of the bearings changes the speed at which the rings spin. TRAVERSE CITY, Mich. -- An energy saving device in production on electric bicycles could earn a spot under the hood of autos. Two major transmission suppliers, Dana Holding Corp. and Allison Transmission Holdings, have signed licensing agreements with Fallbrook Technologies of Cedar Park, Texas. Both companies are testing Fallbrook's NuVinci, a device that operates like a continuously variable transmission. But instead of the belts and pulleys of a conventional CVT, the NuVinci uses a series of ball bearings placed between two rings. 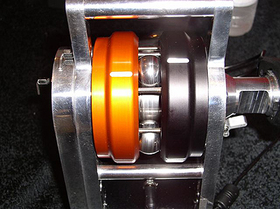 Changing the angle of contact between the bearings and the rings causes the inner and outer rings to spin at different speeds. Fallbrook has been trying for years to break into the auto industry. Now with government-mandated fuel economy standards calling for automakers' fleets to meet 54.5 mpg by 2025, the technology is starting to get some serious consideration. Still, automakers are usually reluctant to introduce new technologies that replace proven components. Used inside an automatic transmission, the device has the potential to improve fuel economy by 5 percent by allowing the engine to operate at it most efficient speed, said Fallbrook president Al Kammerer. The NuVinci could replace a torque converter or the old-fashioned planetary gears, he said. Because the NuVinci is compact and lightweight, it would not be difficult to install, he says. The device could also be used on the front of an engine to vary the speed of the water pump, air conditioning compressor and alternator. Slowing the speed of those accessories when a vehicle is accelerating -- or even decoupling it momentarily -- would also save fuel. The NuVinci has been in production on electric bicycles. It works with an electric motor to reduce pedal effort and eliminate the energy lost during gear shifts. Said Fallbrook CEO William Klehm: "There is a lot of work going on at OEMs to improve real-world fuel economy. The NuVinci makes it possible run the front engine accessories such as the air conditioning compressor at slower speeds or even downsize it."